NetEnt AB (publ) is a Swedish public limited liability company listed on Nasdaq Stockholm. 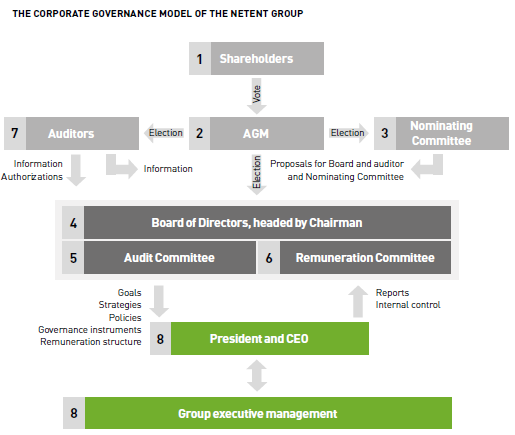 NetEnt thus applies Nasdaq Stockholm’s rules for issuers, and as a listed company the Swedish Code of Corporate Governance (the Code). NetEnt endeavors to apply strict standards and efficient processes so that its entire operations create long-term value for shareholders and other stakeholders. This requires maintaining an efficient organizational structure, internal control and risk management systems, and transparent internal and external reporting.